KIEV, Ukraine -- Intensifying battles, mounting death tolls and dire new warnings from Russia have dragged eastern Ukraine’s long-running conflict into some of the worst fighting since last summer, rendering a months-old cease-fire agreement effectively defunct. 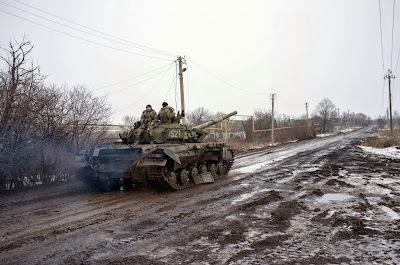 A Ukrainian tank travels a road in the village of Tonenke, some 5 kilometers (3 miles) from the Donetsk airport on Jan. 19, 2015. Government troops and pro-Russia separatists are engaging in recent days in some of the heaviest fighting in the conflict since last summer. Government troops and pro-Russia separatists have been trading heavy fire at the Donetsk airport, a prize that, though more symbolic than strategic, has been the epicenter of punishing recent attacks that have reduced much of the airport to rubble. Each side has claimed to have wrested control of the airport at various points, but militia and army fighters continued to launch strikes against each other throughout the weekend and into Monday. Ukraine’s National Security and Defense Council, meanwhile, accused Russia on Monday of having sent “two battalions”of its troops across the border. That assertion, which could not be independently confirmed, follows months of accusations from both Kiev and NATO that Russia has been fueling the separatist uprising in eastern Ukraine with a steady stream of weapons and personnel. Russia has routinely denied such accusations, maintaining that it is Kiev that is intent on furthering the conflict. But the revived tensions have inspired stern rebukes from Moscow, where Kremlin officials charged that Ukrainian President Petro Poroshenko dismissed a new peace plan offered by Russian President Vladimir Putin last week that would “take urgent measures to cease fire” and pull back large weapons to lines agreed upon in September. “It’s the biggest, even a strategic mistake by the Ukrainian authorities to use force to resolve the crisis,” Russian Deputy Foreign Minister Grigory Karasin told Russian news service Interfax on Monday. Putin’s claim to have authored a specific new plan for a trucecomes as mediated talks between the sides — intended to secure the borders and ensure the removal of foreign fighters from Ukraine — appear to be breaking down. The Kremlin said Putin proposed his plan to Poroshenko on Thursday, the same day French, German, Russian and Ukrainian leaders had been scheduled to meet in Kazakhstan to discuss the Ukraine crisis. But German Chancellor Angela Merkel — widely seen as Putin’s closest negotiating contact in Europe — called off the meeting, saying that not enough progress had been made on the peace plan agreed upon in Minsk in September. Mediated talks between representatives of the Ukrainian government and pro-Russia separatists scheduled for the next day also failed to proceed. U.S. and European leaders say any discussion of rolling back economic sanctions against Russia over its involvement in Ukraine depends on Moscow’s support for implementing the terms of the Minsk agreement — a deal struck between pro-Russia rebels and Ukrainian officials. On Monday, European Union leaders said there were no plans to ease the economic sanctions, given the situation on the ground in eastern Ukraine. Kiev maintains that it has long been offering Russia an “immediate cease-fire” to end the conflict, Ukrainian Foreign Minister Pavlo Klimkin said Monday via Twitter, as long as Russia commits to honoring the Minsk peace plan. Poroshenko said Monday that he was ready to call another summit “immediately” to ensure that the parties keep moving forward on the Minsk agreement. In the meantime, the death toll in eastern Ukraine is mounting. The United Nations estimates that more than 4,800 people have been killed in the fighting there since April. Ukrainian military spokesman Col. Andriy Lysenko said Monday that in the previous day, three soldiers had died and another 66 had been wounded in the hostilities. That was before some of Monday’s heaviest fighting took place — including an explosion that caused the floor to collapse in an airport terminal where Ukrainian troops were located, Ukrainian presidential adviser Yuriy Biryukov said on Facebook. Civilian deaths also appear to be increasing. Rebels said that a hospital in Donetsk was struck Monday and that dozens died in military airstrikes Sunday in Horlivka, according to Russian news outlets. Last week, 13 civilians died when a bus they were on was shelled in eastern Donetsk — the largest loss of civilian life in a single event since a truce deal was signed in September.